In part one of this series, I discussed the myth that single-sport athletes are more successful than multi-sport athletes. I also examined the risks of specializing in one sport too early. See this link if you missed it. 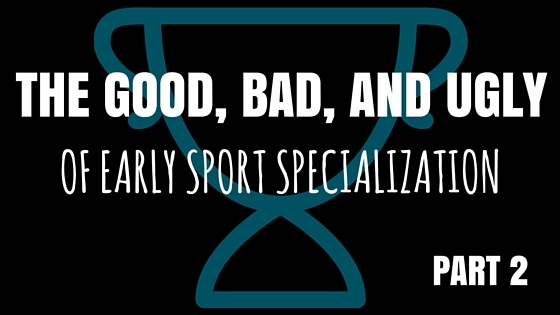 If specializing in a sport early is not good, then how DO we set our kids up for long-term athletic success? Let’s answer that question by taking a closer look at the development of a youth athlete. Athletic Development- What is it? “Athletic development” is physical development of youth that includes development of health, skill, and performance-related components of fitness. A good athletic development program should enhance performance, reduce injury risk, and improve confidence– something to keep in mind when choosing a program. As stated above, youth athletes are ENCOURAGED to sample a variety of sports during childhood (encouraged! Yes, you read that correctly. Try different activities! Not focus on one thing!). Deliberate play activities are inherently motivated- and geared towards maximizing enjoyment and fun. Deliberate practice can increase risk for burnout (Not sure what burnout is? Check out part 1 of this series). Need more reasons why sampling is a good thing? Check out the International Society of Sport Psychology’s position stand on the topic here. See these tips below to maximize your child’s athletic potential. 1. Don’t be tempted by short-term glory. Parents should not feel pressured for their children to succeed in the short-term. Youth development is a process. Feel free to celebrate the “little wins” like weekend tournament victories, or a child’s first hat trick. Encourage kids to continue to excel. But don’t pressure kids to win. Always remember the goal is to develop a well-rounded athlete that doesn’t experience burnout. There are some benefits to deliberate practice – repetition can help build coordination. But the amount of routine and repetition should increase only after building the foundation of sampling and deliberate play. 4. Understand the unique needs of your athlete: Every child matures at a different time or speed. This has an impact on athlete training and development. Coaches should understand there is never one method for all. Early on, youth athletes should focus on developing good form and foundational movement skills. Individualize any extra strength training programs to make the best gains and to decrease injury risk. Does your child have an overuse injury? Find out the safest way to recover. Questions about your child’s training program? Contact CLE Sports PT & Performance today for a free, 15-minute consult. Running cadence – what is it, why should we care, or should we care at all? Slow carb, low carb, no carb? OUR MISSION IS TO CHANGE THE CONVERSATION ABOUT SPORTS PHYSICAL THERAPY. INJURY RECOVERY IS ABOUT YOU, YOUR GOALS, AND FINDING THE OPTIMAL WAY FOR YOUR BODY TO MOVE. GET BACK TO THE ACTIVITIES YOU LOVE-OR DO THEM #BETTER.